January saw volatility return to Lithium and Cobalt markets, both correcting on oversupply anxiety. Glencore announced that its Democratic Republic of Congo (DRC) project Kamoto will expand its Cobalt output to 34ktpa by 2019 (~30% of CY19F global demand). This news impacted Cobalt stocks globally on near-term oversupply concerns. SQM struck a deal with Chile’s government agency CORFO over a long-standing dispute concerning its production quota and royalties on its Atacama brine-based operations in Chile. 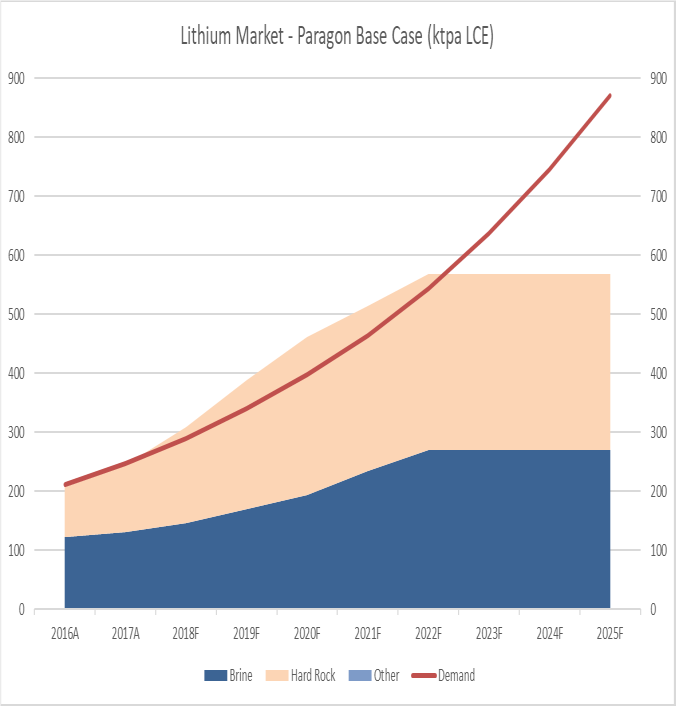 The size of the increase, 2.2Mt of Lithium Carbonate Equivalent (LCE) in aggregate until 2030, saw Lithium stocks globally sold off on oversupply concerns. Despite this, both commodity prices remain strong and continue to rise with the Lithium contract price at US$15,000/t+ and the Cobalt spot price at US$80,000/t+. Rather than be dismissive of what we believe to be ill-informed bearish sell-side commentary, we remain open minded and have assessed the latest events and their potential impact on both markets as outlined below. We discussed Cobalt’s market structure in February 2017. Two-thirds of global Cobalt supply comes from the DRC which exhibits both high social and sovereign risk. This has seen end consumers busily trying to secure supply outside of the DRC. Mining investment in the DRC continues to be high-risk and challenging, with lawmakers only last week proposing changes, including hiking Cobalt royalties from 2% to 10%, increasing free-issued state ownership to a minimum of 10% and introducing a super profits tax of 50%. Changes are touted to become effective immediately, on both existing operations and all expansions. We believe that these sovereign changes within the DRC present greater opportunities for those projects outside this volatile market – including our key Long positions. On the back of SQM announcing its Chilean deal, various pundits were quick to remark that SQM would simply increase its expected CY18F of ~63ktpa LCE production by 3-4x. This disregards the material investment and long lead time required to achieve this and the overall risks to SQM under this new agreement. In our view SQM will not quadruple its production at Atacama. At best, they will double it and this will take 4-5 years with their increased supply being absorbed by continued growing demand. Increases from Atacama will require engineering and financial feasibility, onerous environmental permitting, funding, construction, commissioning and ramp up to production specification. While SQM’s production quota increase is large, it comes with many material risks including: 1) royalty increases from 6% FOB sales of LCE to a progressive structure of >40% for LCE prices over US$10,000/t (which will match Albemarle’s Atacama and be the highest and most costly Lithium royalties globally); 2) lower realised prices given expanding Atacama requires SQM to sell 25% of their production at preferential (lower) prices to Chilean-based downstream producers; and 3) SQM’s Atacama rights expire in 2030 and will be put to public tender between 2027-2029; all three effective immediately. We note that contractual obligations for SQM at Atacama are for 1) 25ktpa capacity addition within 4 years and 2) a further 25ktpa in the following 4 years. And that’s it. Doubling production from Atacama will require capex of US$600m+ for an asset that SQM may lose rights to in 2030. SQM’s effective costs will increase from ~US$2,500/t to ~US$4,500/t LCE, meaning they will likely lose their lowest cost position. In addition, Lithium Hydroxide (LiOH) end-product customers will incur US$2,000/t+ processing costs on top of buying LCE from SQM’s Atacama, making ¾ of their production less competitive again. Note, many EV and Lithium-Ion battery manufacturers including Tesla/Panasonic are using battery chemistries preferring LiOH over LCE. We expect SQM to stage its Atacama expansions to best maintain its market share, realised LCE pricing and ultimately its margins. Lithium is produced in two ways: 1) directly via brines; or 2) via hard-rock mining of spodumene concentrate, then converted in refineries. The Lithium supply response is underway with Australian hard-rock projects funded and in construction. Contrary to current oversupply anxiety, we believe that any issues eventuating within the Lithium market will be in the hard rock supply chain. Firstly, the Pilbara-based projects in WA will be delivered much later than anticipated, as evidenced in recent site trips. Also, the mines will unlikely meet their respective nameplate capacities or desired product concentrate specifications. Secondly, none of these Pilbara-based hard rock projects are integrated with converters. They will be shipping their concentrate to China-based refineries to convert into LiOH or LCE. Adding to the complexities, these Chinese refineries have their own product recovery, capacity utilisation, expansion/construction and lead time issues to deal with. This has been confirmed by Chinese converters, both existing and under construction, as recently as last month by Ganfeng (a leading Chinese Lithium company with its own converters under development), Tianqi and Lionenergy. 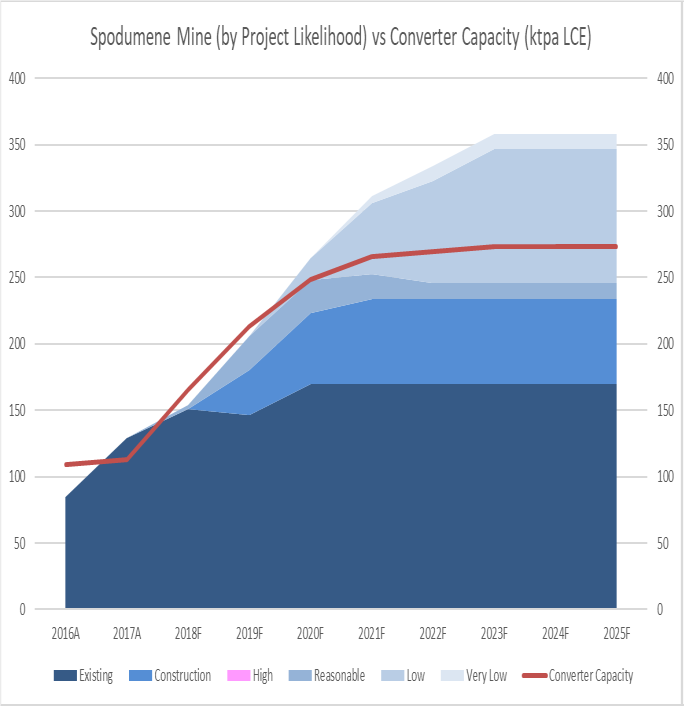 As illustrated in our chart below, even if all of the spodumene concentrate supply eventuates, the bottleneck preventing near-term oversupply in LCE & LiOH will be the converters. Hence any oversupply will be in spodumene, where the higher-cost non-integrated players are most at risk - of which we are short. Demand continues to surprise to the upside (~17% cagr) and we expect this to continue and to absorb any supply increases. Importantly, inventories continue to be low to non-existent with essentially all the major producers fully contracted/sold out. For conservatism, we model SQM to stage its capacity increases in the Atacama, increasing its production to 125ktpa LCE production by 2022. We continue to expect SQM to pursue its global greenfield expansions including expediting both its JV’s with Kidman’s Mt Holland and Lithium America’s Cauchari projects. This is premised on SQM’s growing need to diversify its operations geographically as its Lithium end users are increasingly risk-averse global automakers requiring security of supply. Our chart below from our proprietary Lithium supply & demand model illustrates our current view to 2025. This is based on existing brine and hard rock production sources, including their likely brownfield expansions and greenfield projects to increase total Lithium supply. Given the historical precedence of new supply being late and the lack of engineering expertise in the sector, we believe the modest surpluses shown below are unlikely to eventuate. And even if there are surpluses, they will be readily consumed by end users needing to stock build. Auto Manufacturers (who have to date announced EV investment plans of ~US$90b cumulative) have inventory needs of 6 to 12 months of annual demand, as required for their supply chain. We expect Lithium markets to remain tight and prices to remain buoyant for at least the next two years. In summary, this provides a strong investment window for our key Lithium stock picks. Various supply side factors must be considered, which we capture in our modelling and charts above. Our supply forecast adjusts for: 1) both brine and hard rock capacity utilisations of 80% for greenfield projects; 2) new hard-rock converter capacity (many converters in China are under construction and will be late) and utilisation of 80%; 3) excludes DSO production (mostly sitting as idled inventory, unprocessed nor converted to final LCE product); and 4) reflects committed and funded greenfield projects only. It is no coincidence the industry’s capacity utilisation remains well below nameplate and when demand increases to 80% of the industry aggregate nameplate, Lithium prices spike, as evidenced since 2015. Overall, the fundamental investment cases for both Lithium and Cobalt over the medium term have not changed. We reiterate that the Cobalt market will need to more than double by 2025, and the Lithium market will need to quadruple. This will be no easy feat! Our view is that the ownership, royalty and super profits tax changes announced by the DRC (Cobalt) and Chile (Lithium), will only strengthen the investment cases for our key Longs – as none of our stocks have assets in either the DRC or Chile. World-class operations and/or projects that offer long mine-lives, the best overall margins (lowest quartile all-in cash costs) and least sovereign risk will continue to perform well for the Fund. Such attributes are all core to our key Long holdings including Orocobre, Kidman, CleanTeq and Global Geoscience. Finally, it would be remiss not to mention that in January, Orocobre fully funded its phase 2 LCE expansion and its LiOH project by raising $360m of equity capital at all-time highs of $7.50/sh. This was predominantly from its tier 1 JV partner Toyota Tsusho. Orocobre continues to be attractively priced given its funded strong growth outlook. On a relative basis, SQM CY18F EV/EBITDA adjusted for its Lithium-only segment is ~25x; twice Orocobre’s, indicative of the strong upside in our key stock picks. For further insights from Paragon Funds please visit our website. This is the very best commentary I've seen on Corfo/SQM arrangement. Well done. You state, the "...contractual obligations for SQM at Atacama are for 1) 25ktpa capacity addition within 4 years and 2) a further 25ktpa in the following 4 years. And that’s it." THIS IS KEY INFO that no one else seems to have picked up on! Fears of 216ktpa by 2025 or 2026..... it might not ever reach half that amount, especially due to the arrangement ending at end of 2030!